Service quality is well recognized to influence customer satisfaction. Companies are required to identify the aspects of service quality that determine customer satisfaction so that specific interventions can be implemented to ensure positive customer emotional reaction. 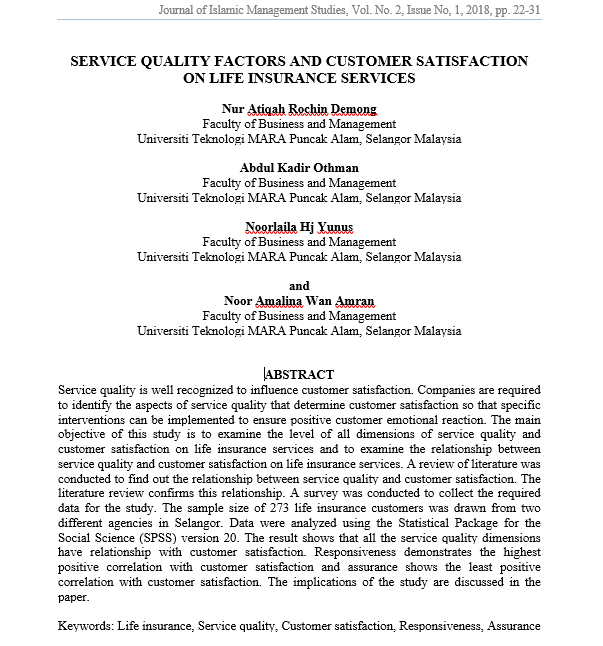 The main objective of this study is to examine the level of all dimensions of service quality and customer satisfaction on life insurance services and to examine the relationship between service quality and customer satisfaction on life insurance services. A review of literature was conducted to find out the relationship between service quality and customer satisfaction. The literature review confirms this relationship. A survey was conducted to collect the required data for the study. The sample size of 273 life insurance customers was drawn from two different agencies in Selangor. Data were analyzed using the Statistical Package for the Social Science (SPSS) version 20. The result shows that all the service quality dimensions have relationship with customer satisfaction. Responsiveness demonstrates the highest positive correlation with customer satisfaction and assurance shows the least positive correlation with customer satisfaction. The implications of the study are discussed in the paper. ROCHIN DEMONG, Nur Atiqah et al. SERVICE QUALITY FACTORS AND CUSTOMER SATISFACTION ON LIFE INSURANCE SERVICES. Journal of Islamic Management Studies, [S.l. ], v. 2, n. 1, p. 23-31, mar. 2019. ISSN 2600-7126. Available at: <http://publications.waim.my/index.php/jims/article/view/96>. Date accessed: 24 apr. 2019.